Save $3.99 on Your Order with Advantage Today! ZoneRx Shakes are the ideal meal replacement formulated with balanced nutrition to help you feel fuller longer. Each shake is designed for maximum satiety and optimal gut health with the inclusion of high levels of polyphenols, prebiotics, and the right balance of protein to low-glycemic carbohydrates. If you love the sweet taste of a strawberry milkshake, you’ll be sure to love these! With a smell that will make you think of fresh strawberries on a summer day, our ZoneRx strawberry shakes are a refreshing way for both kids and adults to start their day right. Plus you can feel good knowing that you are getting the full spectrum of nutrition with its precise balance of protein to carbohydrates, polyphenols and micronutrients. Our convenient 10 serving canister is a great way to sample the flavor and can easily be combined with our other two flavors for a full month of variety. Mornings never tasted so good! What makes each ZoneRx Shake unique? MaquiRx® and CacaoRx™— Our proprietary polyphenol extracts provide 250 milligrams of polyphenols to help activate genes that may reduce oxidative stress, inflammation and the rate of aging*. Fortified with prebiotics— Enjoy superior appetite control and gut health support. 17 Grams of Protein— Balanced with low-glycemic carbohydrates to help support stable blood sugar control. 22 Vitamins and Minerals — Provides a complete meal replacement without the need to add anything additional. ZoneRx Shakes use Controlled Release Nutrition to help control hunger and satiety giving you four to five hours of appetite suppression. The balance of protein to low-glycemic carbohydrates helps control hormones in the gut, brain, and the blood*. This is the foundation of the Zone Diet and is enhanced by the presence of prebiotics and polyphenols. If you want optimal wellness, you need a lifetime strategy and products that deliver results you can see, feel and test. The ZoneRx shakes are part of that dietary strategy. We call it Evidence-based Wellness®. To promote an even better gut health response, we suggest mixing the ZoneRx Shake with 10 ounces of 2% lactose-free milk in place of water. This provides complex sugars not found in plant sources that promote an even greater gut health response by supporting the growth of friendly bacteria while maintaining the balance of protein and low-glycemic carbohydrates needed for maximum Controlled Release Nutrition. The absence of lactose in the product will eliminate any digestive problems for individuals with even the slightest amount of lactose intolerance. Appetite suppression requires both stable blood sugar control and a healthy gut to be working in unison. Our new ZoneRx shakes do both with their combination of a balanced protein to low glycemic carbohydrate ratio plus the inclusion of 250mg of highly-purified polyphenol extracts needed for optimal gut health. Our Controlled Release NutritionÒ technology helps support stable blood sugar levels with the balance of protein to the glycemic load in each food product we produce. That basic concept of Controlled Release Nutrition is now enhanced with high levels of purified polyphenol extracts to promote optimal gut health (1,2) *. Now you have a 1-2 punch for hours of appetite control with unrivaled taste and convenience. If you aren’t hungry, you eat fewer calories. If you eat fewer calories, you lose excess body fat. If you lose excess body fat, your blood pressure, blood sugar, and blood lipids will improve. It’s that easy when you are in the Zone. The ZoneRx shakes make it easier to get there. Great tasting . My grandkids love it and love blending with peanut butter. Having finished my ten day supply of chocolate (see my reviews listed therein), I have since moved on to strawberry and thought I’d pass along the results. My Zone Strawberry ‘Frosty’ (made with ice and lactose free Fairlife Milk) tastes every bit as delicious as the chocolate. In fact, I brought the whole kit and caboodle (sans blender as we have one) to work with me and made it there. My teammate, for whom normal blood sugar lows are also a migraine trigger, asked to try it and agreed it tastes great!!! In fact, she placed an order with me right there on the spot! (As an Advantage Customer I could get it for her at the Advantage price and since I already had a shipment on the way, the extra shipping cost was negligible, saving her money. I have since put an ad/picture of the shakes I pulled off the website, on my Facebook page, thinking ‘if I had a dollar…’ We’ll see how that goes lol. How often does something work exactly as advertised? These do! I used to dread working lunch or brunch shifts because I just couldn’t get a handle on my blood sugar. Even if I ate before hand, if I didn’t eat again exactly at noon I’d be sunk. Not anymore! As with the evening shift, I have a shake before shift at around 11am and I last all the way to the end of the shift about 4pm. The strawberry flavor tastes nothing like any strawberry flavor I’ve tasted before, but I will be reordering later today. Why Do ZoneRx Shakes Look Purple? The purple color, most notable in the vanilla shakes comes from the presence of the highly purified polyphenol extract derived from the maqui berry. Maqui berry contains the highest levels of a special class of polyphenols known as delphinidins. These are the same polyphenols that give red wine its color. I’m not lactose intolerant do I still need to use lactose-free milk? We suggest using 10oz of 2% lactose-free milk in place of water or milk alternatives even if you don’t have issues with lactose. Many individuals may have a low-level sensitivity to lactose even if they aren’t lactose intolerant, so the complete removal of lactose can only help to improve gut health (1). Lactose-free milk is rich in complex sugars similar to those found in human breast milk. These complex sugars are not found in plant sources and thus provide the ideal nutrition to generate more beneficial species of bacteria in our gut. Is the ZoneRx Shake Mix Lactose-Free? 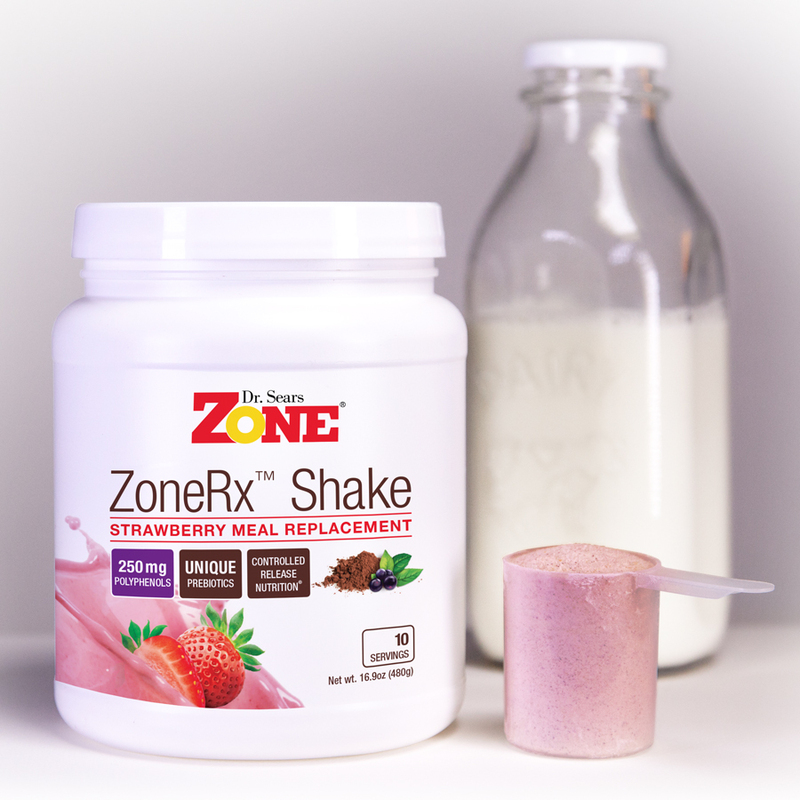 Yes, the ZoneRx Shake mix is lactose-free. The lactose found in standard whey and milk protein sources has been totally removed by ultrafiltration. These are known as isolates because of the removal of lactose. This is a complex process, but essential for optimal gut health. If you use the ZoneRx Shakes, do you still need to supplement with polyphenols? Dr. Sears believes that individuals should consume at least 1,000 mg of polyphenols per day for wellness and athletic performance and about 1,500 mg per day for anti-aging to help with stimulation of AMP kinase*. To get those levels, one would need to eat about 10 servings of non-starchy vegetables and fruits. Reaching those levels with food alone is difficult. Furthermore, many of the sources rich in polyphenols either have pesticide contamination or heavy metal contamination. For example, strawberries and spinach are good sources of polyphenols, but each is often rich in pesticides. Cocoa powder which is the basic component of chocolate products is often rich in the heavy metal cadmium. The polyphenols we use in the ZoneRx shakes are highly purified polyphenol extracts that have GRAS status meaning they have passed strict testing to be able to be used in food products. Virtually no other polyphenol extract available has this designation. Although we are the only company to list the levels of polyphenols in all of our polyphenol-enriched products, it is the type of polyphenols in those products that makes a difference. The polyphenol extracts used in the ZoneRx Shakes is a combination of a chromatographically purified Maqui berry extract, rich in delphinidins to help support improved blood sugar control, and cadmium-free cocoa extracts that help support improved blood flow and reduction of insulin resistance. Both of these polyphenol extracts have been supported by clinical studies (1). Are ZoneRx Shakes Gluten Free? Yes, the ZoneRx shakes are gluten-free. Unless someone has true celiac disease, gluten should not be a concern as Dr. Sears and vast majority of the gut research community believes that individuals who are “gluten sensitive” may actually have sensitivity to FODMAPs (Fermentable Oligo-, Di- and Monosaccharides And Polyols (1). Yes, the ZoneRx shakes are non-GMO. What Allergens do the ZoneRx Shakes include? 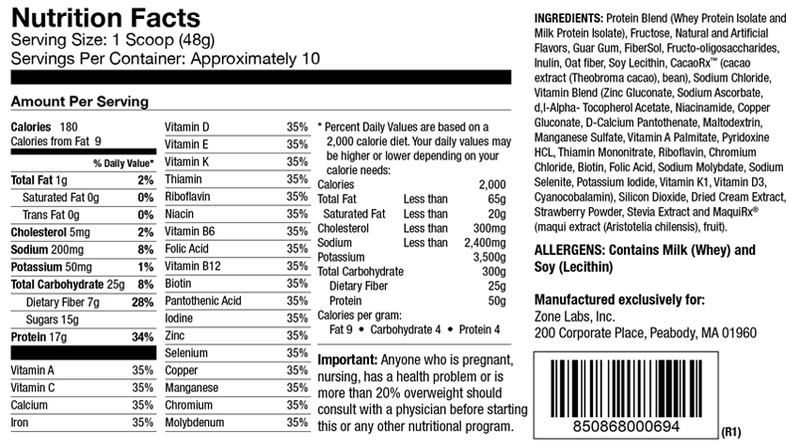 The ZoneRx shakes do contain milk and soy. These come from the milk fractions that supply the protein and the soy lecithin used as an emulsifier in ZoneRx Shake. 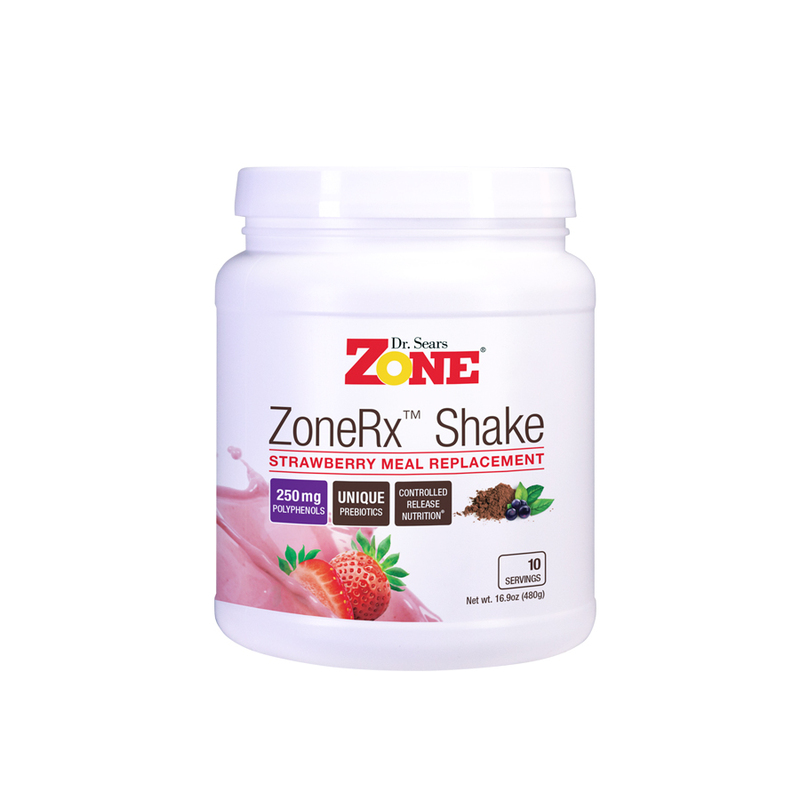 The whey protein isolate and milk protein isolate used the ZoneRx Shake are both lactose-free. They are more expensive, but provide a far better quality of both proteins with significantly less potential effects on gut health since lactose-free products also low in FODMAPs. What are the sources of prebiotics in ZoneRx? Prebiotics are the fermentable fibers essential for gut health. The sources of prebiotics in ZoneRx come from a variety of natural fermentable fibers including guar gum, inulin, oat fiber, fructo-oligo saccharides, and a synthetic resistant starch (Fiber-Sol). These fermentable fibers are required to supply the necessary energy and metabolites (such as short chain fatty acids) for maintenance of gut barrier integrity to help prevent a leaky gut*. However, without adequate levels of polyphenols present at the same time, optimal gut health will not be achieved. 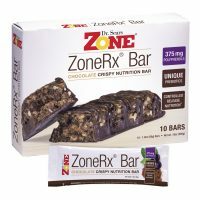 Does the cocoa in ZoneRx contain caffeine? The cocoa extract used in ZoneRx Shakes is a highly purified to reduce heavy metals, such as cadmium, while simultaneously increasing its polyphenol content. There is some caffeine in the cocoa polyphenol extract, but in very low concentrations, and when this is diluted in the final shake it represents far less caffeine than found in a cup of decaffeinated coffee. Are ZoneRx Shakes suitable for children? ZoneRx Shakes are ideal for children as they are balanced in protein and carbohydrate, plus they contain both polyphenols and fermentable fiber (i.e. prebiotics) that promote a healthy gut. We might suggest using ½ a scoop and 5oz of lactose-free milk for small children because of their smaller size. Do ZoneRx Shakes contain artificial sweeteners? No. Artificial sweeteners can cause adverse changes in the microbial composition of the gut. 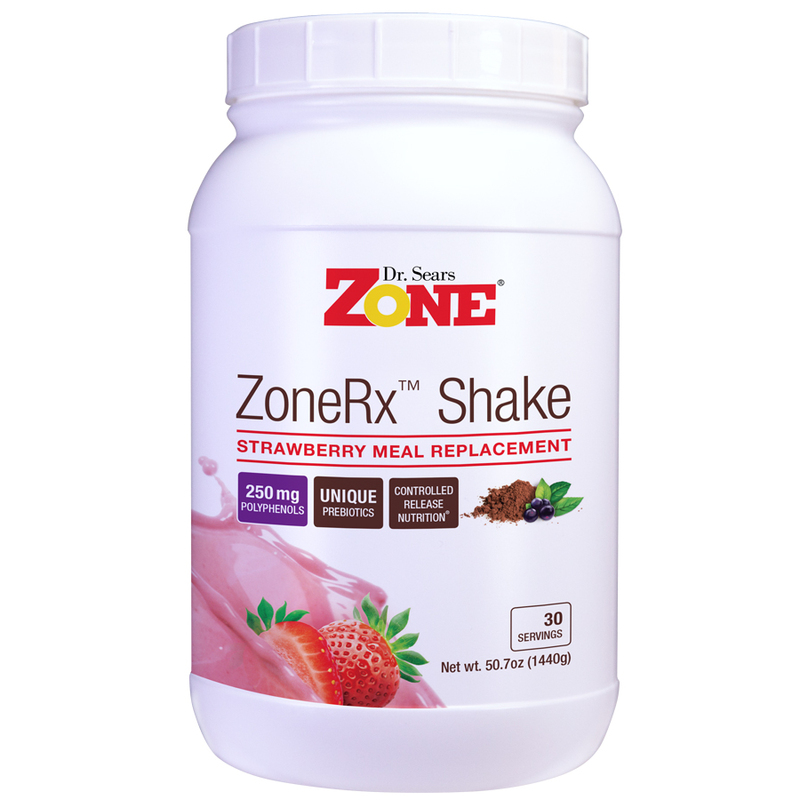 The only sweeteners used in ZoneRx Shake are natural sweeteners such as fructose and stevia. Why is fructose one of the sweeteners used in ZoneRx Shakes? Fructose has a far lower effect on insulin secretion compared to glucose. The goal of Controlled Release Nutrition is to stabilize blood sugar levels by preventing excess insulin secretion thus increasing appetite control. This depends on maintaining an appropriate balance of protein to the glycemic load in every meal. The high levels of polyphenol extracts used in the ZoneRx Shake further enhance the stabilization of blood sugar levels as well as improving gut health thus helping to support even greater appetite suppression. Why do you include soy in the shakes? Zone shakes contain soy lecithin which is exceptionally low in isoflavones and used as an emulsifier to help with texture and creaminess.